We were talking about competition, focus, and purpose, and those twelve words, uttered by my business coach, were ripe with lessons. If you have something of value to offer the world, there’s usually a business in it. That other businesses work hard (and spend money) pushing the illusion that they are the unchallengeable leader in a market. That competition can be an excuse for inaction. Perhaps you’re an artist? Maybe a musician, a writer, a blogger, a podcaster, or a basket weaver? It doesn’t matter. If other people find value in your work, there may be business in it. “… you’ve got something to offer,” my coach said. He was right. I’d taken for granted the fact that I’ve spent my entire professional career learning, testing, and executing organization and productivity strategies. Could I keep this knowledge and these lessons to myself? Sure. But that’s not helping anyone. That’s not providing value. What about you? What have you spent your life and career learning? What do you know so well that you take it for granted? Others just might find value in it. Use your skills, your knowledge, your experiences to help others on their journey. Maybe that’s a painting. Maybe it’s a photo. Maybe it’s teaching your audience a new skill on your podcast. Whatever it is, you have value the world needs. 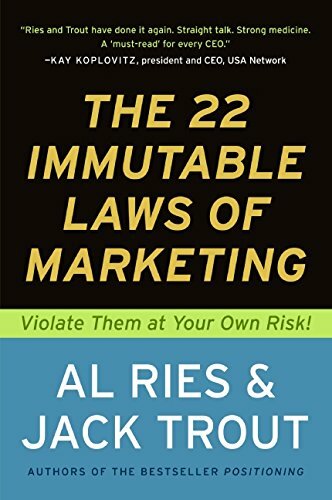 In The 22 Immutable Laws of Marketing by Al Ries and Jack Trout, the law of exclusivity states, “two companies cannot own the same word in the prospect's mind.” Apple owns “design.” BMW owns “performance.” Burger King owns, “your way.” But that doesn’t mean their competition can’t build a business in the same market. It simply means you have to pick a different angle. There’s a place for what you do. Your competition might be traipsing all over your territory, but you can still run a business. Your competitors may be copying your every move, but some customers will still want to buy from you. Find out why your customers stick with you instead of your competitors, then double-down on that angle. Find out how customers stumbled across your work, then double-down on that promotion strategy. Find out where customers heard about you, then double your presence there. Just because someone else is doing something similar doesn’t mean you can’t build a business. There’s a place for what you do. Finding a competitor that does what you do can be debilitating. You think, “someone already beat me to it.” You doubt yourself. You second-guess your unique experiences. And, ultimately, you don’t take action. But how many times have you bought something from a clear competitor to another purchase you’d already made? Likely more than you realize. Looking at my bookshelf, I have eight different books on writing. My music library is full of dozens of various singer/songwriter musicians. My personal computer is a Mac, and my work computer is a PC. Just last month I purchased two programs that turned blog posts into PDFs. I guarantee these two companies think of themselves as competitors, but I bought both because they are different enough for me to want features from each. The fact of the matter is, nobody owns the market on what you offer. They may have market share, but they don’t own it. You can come in with a different price. You can play up a unique angle. You can establish more trust. You can advertise where they aren’t. You can do any number of things to land business for yourself without going head to head with your opponent. When my business coach told me, “Nobody owns the market on productivity," he was telling me not to worry about the competition. He was also reminding me that I was making excuses for not taking action. Don’t let your competition hold you back. Know your unique, creative differences, find an angle, and take massive action. Mike Mehlberg helps Creators and Entrepreneurs develop a personal organization and productivity system to grow their business with purpose and speed.